On this visit to Florida, we wanted to take each of our Florida grands out on a day of their own where they could have one-on-one time with Grandma and Grandpa. We made the choice for our little 3 1/2 y/o redhead and took her to Theater of The Sea (a much smaller version of Sea World with no orcas) in Islmorada. We'd been there with everyone last year but she was so little I didn't think she'd remember it. When it came time for our older granddaughter (6) to stay with us, she also chose to go to Theater of The Sea so just to make her visit different than the others and give her something to talk about that they hadn't seen, we visited the Florida Keys Wild Bird Center that's just down the road from the condo where we stay. We hadn't been there before so it was new to us too. While it wasn't the fanciest place going but it was interesting. There were lots of pens with quite a variety of birds. Hawks, owls, pelicans, a falcon, songbirds, parrots, the list goes on. 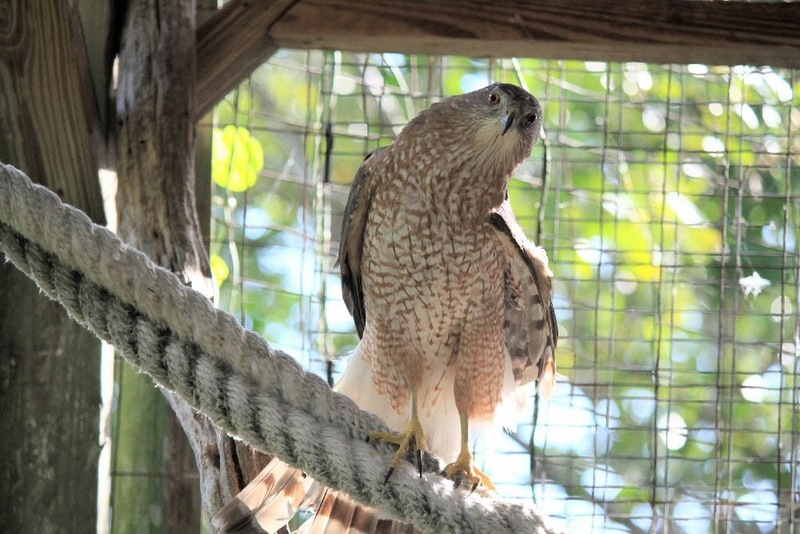 All of the birds have been rescued and are being rehabilitated for release if it is possible. 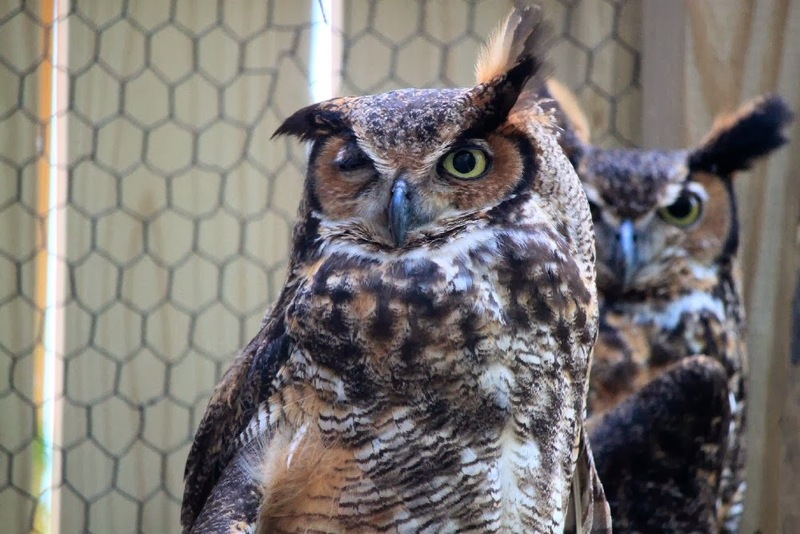 The Center was begun by Laura Quinn who spent 35 years in her mission to rescue and rehabilitate wild birds. She died in 2010 but the work goes on with dedicated people who see the value in preserving the beautiful creatures. The boardwalk extends past all the pens and goes out to the Florida Bay where healthy pelicans abound--probably waiting for their friends and family to get out of rehab. 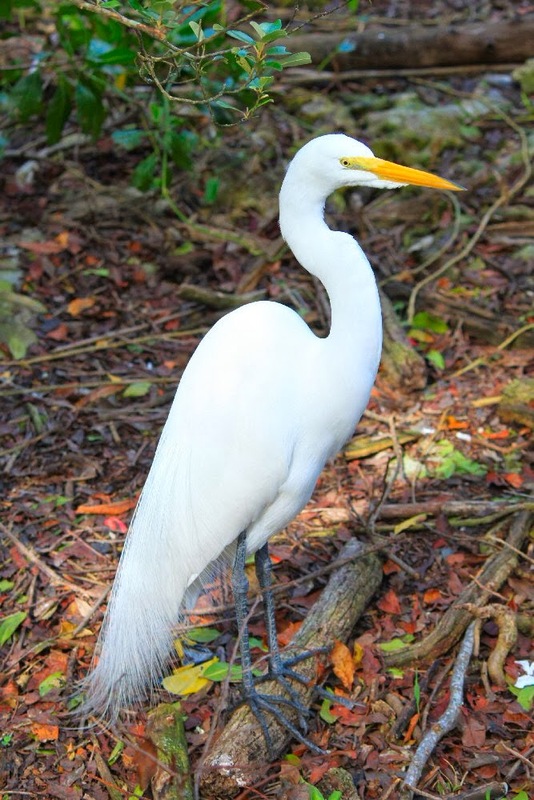 White egrets strutted freely around the compound showing off their gorgeous lacy tails. We followed the boardwalk along the shore to a pond or inlet that had a blind set up so you could watch the water birds without disturbing them. There was a great find among them. A roseate spoonbill! 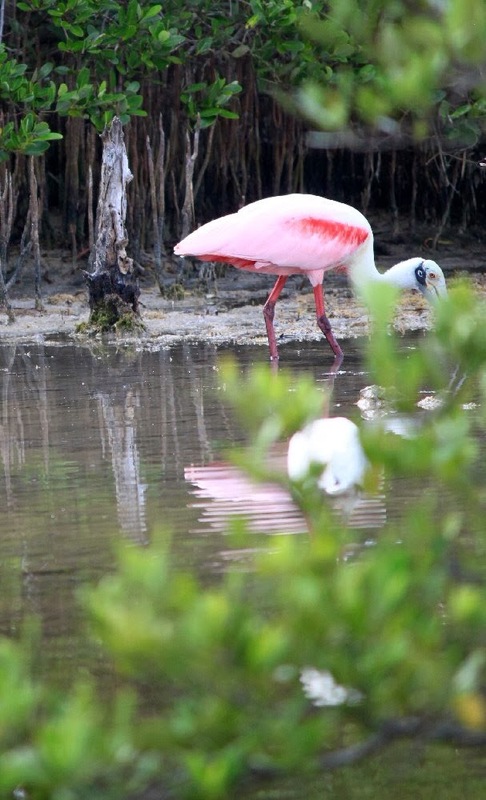 They are a beautiful pink like a flamingo with a flat spoon-shaped bill, thus the name. Passing by the main pens again, we crossed the driveway to look at the pens with parrots and songbirds. Another boardwalk wove its way through the mangroves beyond these pens and we followed it. While we didn't see any birds, we did come upon a good sized yellow land crab that scuttled back into its hole when we stopped to look at him. Unfortunately I had turned off my camera and couldn't get it back on in time. It was a nice morning walk and an interesting look at some birds we wouldn't have seen otherwise. Well worth the $5 donation--especially when you know it is going to help this wonderful mission.